Make sure you like Find My DIY on Facebook to be updated each time we find new ways for you to be creative. Are you looking for a terrific craft project to do at home for a gift or even to sell and make money? 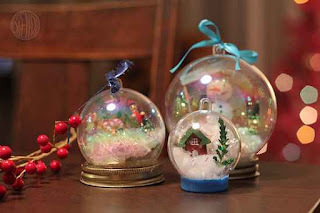 One idea that you may find really interesting is making your own homemade snow globes. You do not need to any water if you know how to make no water snow globes. The process to make no water snow globes is not that hard at all. All you will need is the proper containers for the project. If you prefer traditional round looking snow globes, then you need snap apart ornaments and snow glitter. A few lids from old mason jars and a few other supplies jars will also be needed. Find My DIY © 2018. Powered by Blogger.